High River Sauces Top Fuel Verde Sauce is the result of a collaboration between Steve Seabury of High River Sauces, Stephen Pearcy (Lead Singer for Ratt), and Chef Chris Santos. And the result is a “not your average hot sauce” that has found a permanent spot in our fridge. The bottle has a wide mouth normally found on BBQ sauces. Top Fuel Verde, which has almost a relish consistency, pours easily from this style bottle. The sauce has an olive green color and a medium thickness to it – very appealing visually. What’s not so appealing is the label. It’s just a bit too busy, and lacks any pop in color. Fortunately, the title of the sauce is easy to see and read, but the main graphics suffer from a lack of detail and color. Of course this does not affect the special taste of Top Fuel Verde. My first taste, poured onto a spoon, really caught me off guard, as I was expecting a tangy bright green chile flavor based on the smell and the consistency. I was surprised to discover a more low-key mellow flavor, probably due to presence of the olive oil, cilantro, and garlic. (My surprise was akin to ordering a Coke and getting iced tea). As I tasted more, now that my mouth knew what to expect, the subtle combination of flavors bloomed in my mouth, leaving me with a nice, warm heat without any sting (thank you for not adding habaneros!). The vinegar comes in at low-to-mid range, allowing the tomatillos, the peppers, and the other ingredients to blend nicely together, and the fact that there is NO salt is an extra bonus. 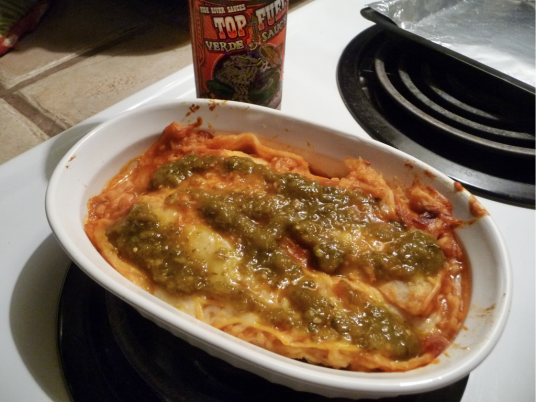 We had some leftover chicken enchiladas in the fridge, so I heated them up and topped them with this sauce. What a lovely surprise! 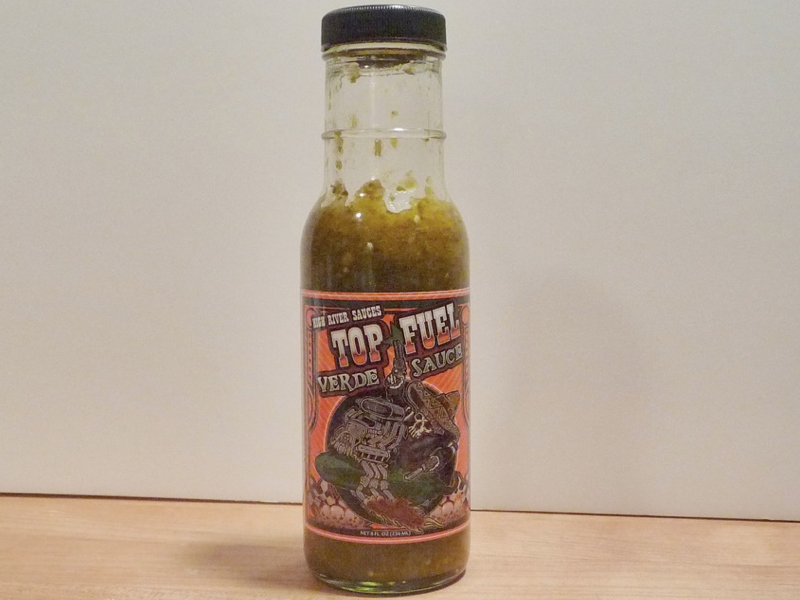 Not only did the Top Fuel Verde sauce add a little heat, it also added a lot of flavor. When I exclaimed “This is really, really good”, Brian knew I was a happy girl! This is a sauce that you could serve to those “mild to moderate” chileheads in your life without hurting them – just leave the bottle on the table for the folks who want more heat. 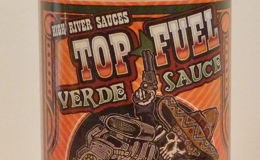 You can purchase Top Fuel Verde and all of High River Sauces at HighRiverSauces.com and tell Steve we sent you! This is definitely one for me! I adore salsas verde, it’s become our favorite and the heat level here sounds perfect for us. Great stuff! I have a bottle in my fridge…not a full bottle mind you. Nice review!! You both ROCK!!! Thank you for the kind words and I am so excited that you are digging the Top Fuel Verde. One of my friends said it tastes great on Frog Legs too. I will take is word on that one. LOL. Thanks again!!! Looking forward to Peppers. 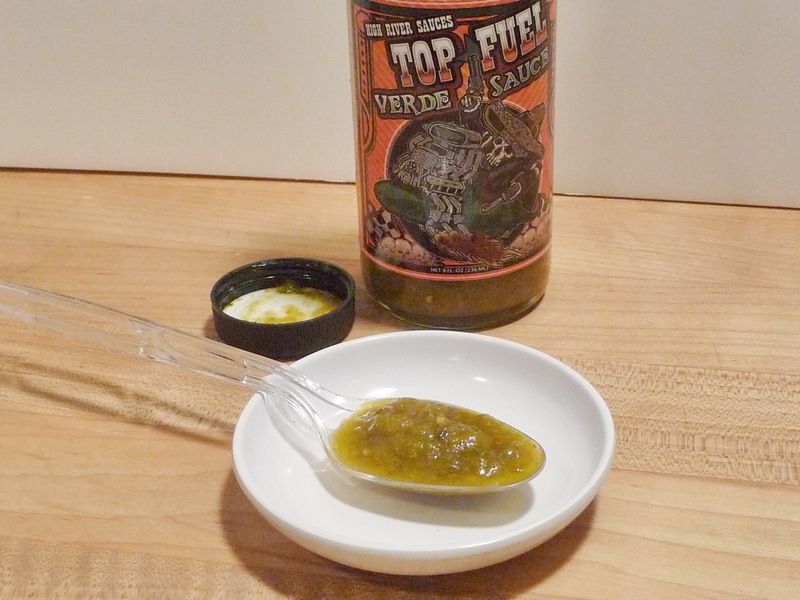 Great responses for my Top Fuel Verde Sauce! A big thank you for everyone getting heated up. Also like to thank Steve Seabury of High River Sauces and Chef Chris Santos for making our sauce a hit. Enjoy, Top Fuel Verde is great on any meal, and I mean ANY meal!